Domesticating Wolves: Why Did Humans Do It? Are There Any Consequences? The process of domesticating wolves started thousands of years ago but how has it fared so far? Scientifically called Canis Lupus, humans acknowledge wolves as wild animals since they became aware of this creature’s existence many thousands of years ago. The Canis part of its scientific name is what gave rise to our popular name for domesticated dogs: canines. In addition, we know that wolves and dogs are related genetically and this has been proven time and time again. We have successfully domesticated dogs (Canis Lupus Familiaris), but wolves on the other hand remain wild with several studies to find out ways to tame this wild animal proving abortive. A leader in wolf research, Dr. Kathryn Lord is a renowned evolutionary biologist based at the University of Massachusetts Amnerst. 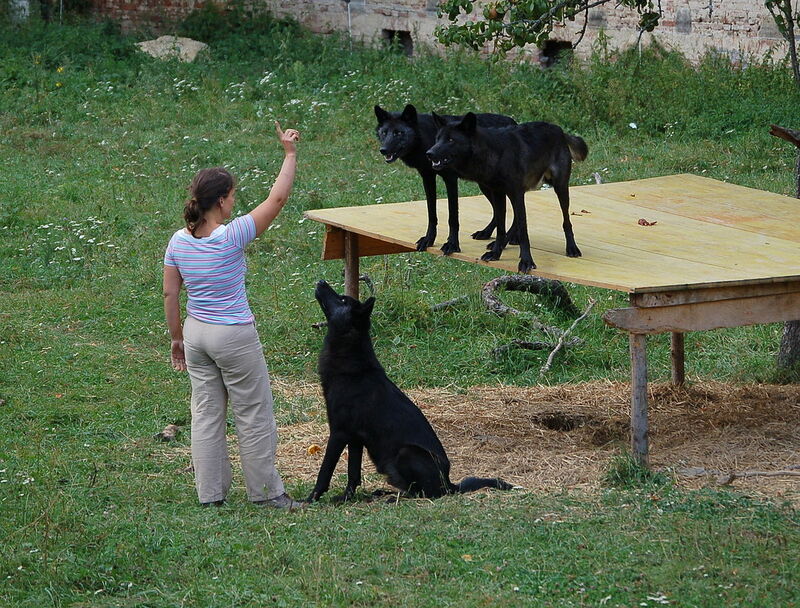 Over the years, she has shared her experiences with experiments aimed at domesticating wolf. Certainly not an easy process at all. In her experiences, to create a bond with wolves is achievable at the puppy stage. Keepers have to be with the pups 24 hours a day and 7 days a week to create that bond and affinity between man and wolf. They would also need to sleep with the animals and bottle-feed them every 4 hours daily. Her findings were conclusive and it showed that despite the genetic differential behavior between domestic dogs and wolves, it is possible to domesticate wolves but not tame them. Science tells us that both wolves and dogs split from a common ancestor about 15,000 years ago. Thereafter, two subspecies of Canis Lupus emerged. But while one of them chose to remain wild and apart from humans, the other Canis Lupus Familiaris chose human companionship. The branch that chose human companionship are the dogs we recognize today. Our much-beloved man’s best friend has come to depend on us completely for survival. But why did human beings begin domesticating wolves in the first place? Well, most theories point to a time where there was a change in how humans lived. Once humans gradually abandoned their nomadic lifestyle choosing instead to build homesteads and practice farming, the ball was set rolling, so to speak. By settling in one location, people would no doubt generate garbage especially leftover food that would in turn attract wild wolves. As the wolves gradually lost their fear of humans they would scavenge garbage dumps over and again. Or, maybe the animals were just too weak for hunt for whatever reason. Getting rid of unwanted trash. Warning humans of other more deadly predators closing in. For use as work animals. Basically, a mutually beneficial relationship was born. Although they are closely related species, wolves still do not respond easily to human control as dogs would. But Why Is Domesticating Wolves So Difficult Today But Easy For Dogs? As mentioned before, you can train a wolf, but you cannot tame it. Wolves will still birth wild offspring which instinctively (via genetics) are scared of humans as one of their age long persecutors. Dogs and wolves may be genetically connected to about 98 percent, but the 2 percent deviation seems responsible for the hostile behaviors of wolves. Dogs can easily cooperate with their trainers or owners in exchange for food rewards whereas wolves would rather hunt in teams and live in family groups called wolf packs. While dogs evolve to avoid conflict, wolves are territorial animals that behave aggressively towards their own species and others. These differences are the major causes of our inability to truly tame wolves. Researchers say the key to these differences lies in the sensory experiences and socialization of these two canines at birth. At birth, wolves develop their sense of smell faster, before then developing their sense of hearing and sight. As they grow up, their sense of hearing and sight attracts fear. Dogs, on the other hand, enter their socialization window after their sense of hearing and sight develops fully before developing their sense of smell. This takes away the “fear factor” as they grow to see humans among them and create a close bond during their formative stage of life. An animal may be domesticated but its still not tame. A tamed animal is a wild animal already previously adapted to humans in general in a natural way or by human intervention such as animal training. So, only if an animal can overcome its fear of different humans at a relatively close distance can it be truly tamed. So far, humans have not been able to bring wolves this far and below are some of the conditions/consequences researchers have learned in the process of domesticating wolves. Although closely related to our domesticate dogs, wolves still resist control or leading by humans. For that reason, a lot more work is necessary to obtain some level of control over wolves. Wolves still require much more space than dogs do. They need between 25 to 40 square km (10 to 15 sq mi) for basic daily exercise. Wolf pups are not easy to raise. They require quicker socialization than their dog cousins. In fact, wolf pups will stop responding to attempts at human socialization by 19 days. Dogs on the other hand will still respond at 16 weeks old. Captive/domesticated wolves are typically shy and wary of humans they are not familiar with. Therefore, they will avoid eye contact with strangers and will not obey any commands made by any other person than their keeper. Visitors have to be wary around these animals even when they appear friendly. That’s because they could attempt to dominate or bite them. Normal dog food will not do. To thrive, an adult wolf needs 1 to 2.5 kg (2 to 5 lbs) of meat, skin, fur, and bones daily. Captive wolves are talented escape artists. They will easily learn how to escape confinement over and over again. So their keepers must always be alert. There will always be consequences in an attempt to domesticate wolves. The most important consequence and warning to note is that domesticated wolves DO NOT respond well around strangers. They may respond well to their keepers/owners and other members of their immediate family but strangers or visitors are always in danger of attacks and bites. This has been reported several times and it’s a real danger for the few who attempt to keep these wild animals as pet in their homes. These domesticated wolves are genuine threats to livestock around the neighborhood. The average domesticated wolf still shows traces of wild behaviors. For example, the sight of livestock, like chickens, around them can trigger these wild behaviors. The urge to hunt livestock is almost irresistible! This entry was posted in Wolf Information and tagged alpha wolf, can you tame a wolf, dogs and wolves, domesticating wolves, domestication of wolves, facts about wolves, gray wolf, grey wolf, history of wolves and dogs, wolf pack, wolf pack mentality, wolf species, wolves on December 16, 2017 by Roselyn Onuche. ← Do Wolves Howl At The Moon Or Not? Do Wolves Howl At The Moon Or Not?